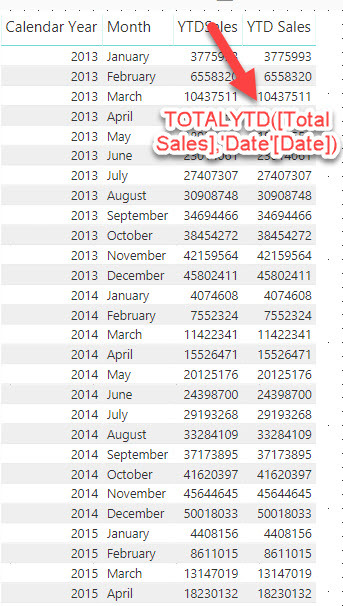 This post explains how to achieve Year to Date calculation using DAX script. In DAX, there is a pre-defend function available to get the Year to Date calculation. Also, for the quarter to date & month to date. Let us consider a field called “Total Sales”. We will be used the Total Sales & “Date” table. Compare the result TOTALYTD() with our script. Let us consider that we are in row 2014 – March row on the above table. ALL(‘Date’) => This line of code returns all the dates from date table. The above line of codes returns, current row year and last date of the current row month. Hariharan Rajendran is a Microsoft Certified Trainer and Lead BI Solutions Consultant with 8+ years of experience in Database, BI and Azure platforms. Hariharan is also an active community leader, speaker & organizer and leads the Microsoft PUG (Power BI User Group – Chennai), SQLPASS Power BI Local Group – Chennai and an active speaker in SQL Server Chennai User Group and also a leader in Data Awareness Program worldwide events. Hariharan also frequently blogs (www.dataap.org/blog), provides virtual training (on ad-hoc basis) on Microsoft Azure, Database Administration, Power BI and database development to worldwide clients/audience.